Owing to the efforts of our skilled professionals, we have been constantly engaged in offering a qualitative assortment of Bauxite Ore.
Bauxite available in various grades and purity as from 35 Al2o3 to 55 Al2o3. We are one of the most well-distinguished companies in the market that are into offering Bauxite Ore.
We are supplier of Bauxite ore with different grade like Al2O3 30, 30-35, 35-40, 40-45, 45-48, 48-52, 54%.In different size up to 0-100mm. We can supply up to 100000mt per month. Bauxite, an aluminium ore, is the world's main source of aluminium. It consists mostly of the minerals gibbsite Al(OH)3, boehmite γ-AlO(OH) and diaspore α-AlO(OH), mixed with the two iron oxides goethite and haematite, the clay mineral kaolinite and small amounts of anatase TiO2, Ilmenite, FeTiO3, and FeO TiO2. We source high quality Ores and Others that are majorly used in numerous of Industries for diverse uses. The wide collection of Mineral Ores is free from impurities and rich in other essential features. Our esteemed client’s can avail the wide gamut of Mineral Ores at very pocket friendly price. Bauxite is the chief mineral ore of Aluminum. We offer superlative quality Bauxite Ore that is extracted from the earth surface with the help of heavy duty latest machines. We are counted among the well-established Bauxite Ore Manufacturers and Bauxite Mineral Suppliers in India. Mostly customers preferred to purchase quality products, so we are involved in providing Bauxite Ore.
WE HAVE BAUXITE GRADE 45+ WITH GOOD QUANTITY TO SUPPLY THROUGHOUT THE YEAR. OUR EX MINE PRICE IS INR 1950 NEGOTIABLE DEPENDING ON PAYMENT TERMS. KINDLY REVERT WITH YOUR INTEREST. WE CAN ALSO PROVIDE FOB BASIS. We are a prominent Supplier of Bauxite Ore in the industry. 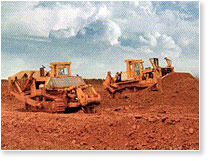 We are actively engaged in offering quality Bauxite Ore, which is further used in various industrial applications. The Bauxite Ore available with us is acquired from the best sources. We offer different grades of Bauxite Ore at very affordable prices.